Sadry and Yadi work at a petrol station removed from the main traffic routes since the building of a ring road. It is winter and heavy snow lies on the ground. Sadry, a former performing strongman who accidentally lost an eye, is behaving strangely. He takes off from time to time and seems obsessed with the weather. Yadi is in love with a girl from a nearby town and sends her passionate letters via the local postman. Sadry and Yadi occasionally receive a visit from Orooj, the neighbourhood undertaker, their only contact with the exterior. The idea of this film, originally under a different title, came to me during my studies. At the time I often travelled from Tehran to my home town, Boroujerd, in the south-west of Iran. I often thought of the petrol station that was once situated along the highway and whose prosperity had disappeared with the building of a ring road. I also thought of likable outsiders such as Sadry and Yadi, left on the margins of society and forgotten by the rest of the world. The fate of such people has always fascinated me. I often dreamt as the film began to take shape and as my dreams were often colourless and grey, I decided to shoot in black and white. The close cooperation of my friend Touraj Aslani as director of photography was of utmost importance to me. 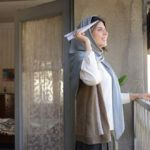 The actors Mohsen Tanabandeh, Nader Fallah, Mahmoud Nazaralian and Hassan Rashid Ghamat are no strangers to cameras, the latter also doubling as film editor and short-film director. 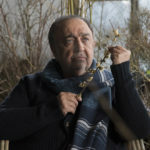 Mohsen Namjou who plays the role of the postman is a composer in real life. As snow was an essential element of the story, I must admit that Mother Nature also had her role to play. “A Few Kilos of Dates for a Funeral” is a story of ordinary people with all their qualities and defects……but it is above all a story of love.